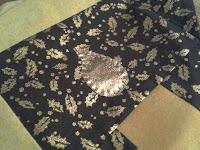 I've got my jobs for the day done, and have found some time to do something new - applique! 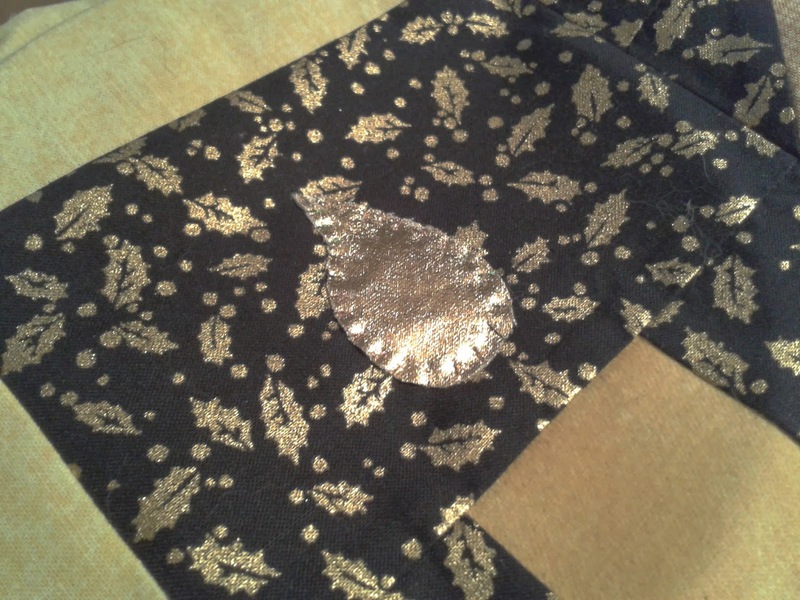 On my Challenge quilt, I have a flame in gold to sew onto each candle, so I ironed some fusible interfacing to my gold fabric, then drew and cut out two copies of the flame and hand stitched them into place with gold metallic thread. I must look up applique techniques on Youtube - my method made sense to me, but I've no idea if that's the way everybody else does it! 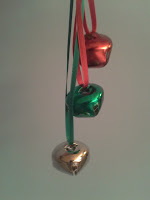 Now I have also been playing with these beautiful bells, and we'll come back to them later. Funny things, bells - my mum always says that she couldn't move out of the area because she just has to go outside and listen to her parish church bells pealing in the New Year, and I remember as a child being allowed to stay up until midnight, and going out into the cold night air and hearing them too. Church bells, jingle bells, school bells - what do they mean to you? And while you're thinking about that (and you have signed in to Mr Linky so we can all share what you're up to this weekend? ), I'm off to the kitchen to make something CHOCOLATY! Yum! I know what your Mum means about the bells. As a kid we lived in Church Lane ... no surprises what was at the end of the road. I loved hearing the bells at any time, but especially late on Christmas Eve calling the congregation to the 11pm service. Hmmm, what memories you have conjured up - the whole church was lit by candles. The Nine Lessons and Carols service used to be lit by candles on the ends of the pews - a health and safety nightmare these days, I think! Now there are weedy tea lights in safe holders - which give out hardly any light - you end up squinting at the order of service in the gloom. I love bells, too and carillons. In my area many of the churches are closing so there aren't many church bells being rung anymore. I had to look up carillons, Joanna - they look fantastic! I must see if there are any round here. I hope the bells are restored along with the church buildings, Sharon - I do like a good bell-ringing. Until you mentioned them I hadn't realised that we just don't hear them round here at all. As for the aaplique, it seems to me there are so many ways of doing it that it's best to just go with the one that feels right to you. It certainly seems to have worked for this project, Sue. One of my gardening chums (who is just fabulous with fabric) tells me that Bondaweb is useful. I'd investigate further if I was to do more, but more applique is not on my hit list at the mo.